A few months ago, I wrote about how one might end up with a Message #1701 error when attempting to execute an ALTER TABLE…ALTER COLUMN statement. You can refer the original post here. Vishal Gajjar (blog) recently wrote about the Table Designer component of SSMS. In his post, he draws attention to the fact that altering the data-type of a column causes the Table Designer to re-create the entire table, which is one of the solutions to this problem. However, the table designer while useful in this case, may not be that useful always. As I try to build my case through the post, do let me know whether the conclusions I derive sound as logical to you as they do to me. Creating or altering table ‘MyTbl’ failed because the minimum row size would be 8068, including 7 bytes of internal overhead. This exceeds the maximum allowable table row size of 8060 bytes. The root cause of the error was that the maximum allowed row size in Microsoft SQL Server is 8060 bytes (calculations presented in the original post here). The ALTER TABLE statement attempts to expand the column “in-place”, i.e. it copies the data over to a new column with the new length specifications on the same row, making the row total now 8061 bytes, which is more than the 8060 maximum – resulting in the error seen. Let’s see how the table designer can help us overcome the issue at hand with the row size increasing the 8060-byte limit. Right-click the table in question and choose “Design” to launch the Table Designer. In the Designer, simply change the column size. For those interested, the scripted output of SSMS is as under, with descriptive comments added by me as required to demonstrate the essentials. The bottom line is: If efficient DDL can be written to make the changes required, avoid using the Table Designers as far as possible. There is no denying that the designer is supposed to make life simpler, and that’s where I would share my philosophy around these. I use the designers as a stepping stone using the scripts generated as a base, and then trying to improve upon them. After practicing this a couple of times, I was able to churn out pretty decent, standardized DDL without using the designer at all. Microsoft SQL Server comes with a set of some pretty good designers (Table & Query designer to name a few) which are useful productivity enhancers under most conditions, but might end up causing issues in other cases. Use them with caution. Subscribe to my posts via E-mail: Subscribe here | Read my posts via your favourite RSS reader: Click Here! 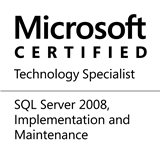 This entry was posted in #SQLServer, Blog, Imported from BeyondRelational and tagged #SQLServer on November 3, 2011 by nakulvachhrajani.